We got a pass, which included the hop-on-and off red bus, as well as a ferry ride and entry into Alcatraz. Some may consider the red bus to be a cheesy option but we always find it a great way to explore a new city and to get our bearings and cover off all of the main attractions. Plus, the kids absolutely loved sitting up the top of the bus, and the San Fran weather really turned it on for us. 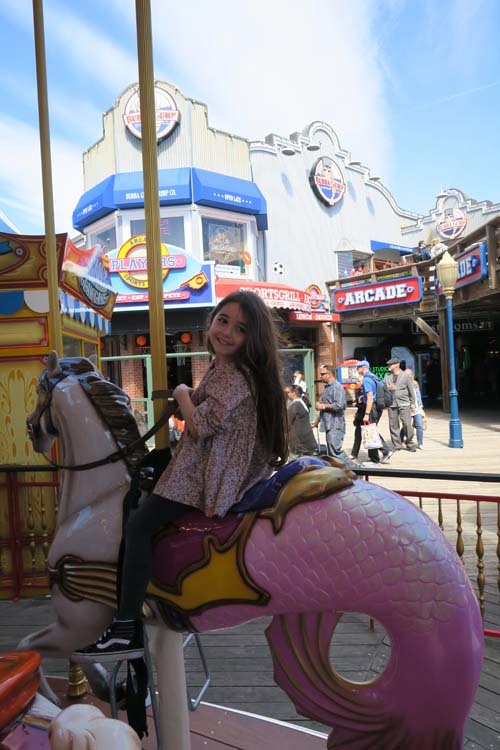 Alcatraz was a short ferry ride from the much-loved Fisherman’s Wharf so we headed to the wharf early to give the kids some time to check out the beautiful old vintage carousel and watch the sea lions on the world-famous pier. We boarded the boat and cruised over to Alcatraz Island for our 45-minute historical audio tour. Our then-three-year-old was jet lagged and slept the whole time but our five-year-old loved every minute, was really interested in the audio and the rich history of the jail and is still talking about it as one of the highlights of her trip. We also got an incredible view of the city and San Francisco Bay from the island. Our day started with a coffee [something that, I have to admit, we do much better in Australia!] followed by a stroll past the Painted Ladies, over to Golden Gate Park where we spent an entire day. Our girls loved the beautiful gardens and Koret Children's Playground; we took some snacks and had a picnic under the trees. We found the most beautiful, vintage carousel [built in 1914] we had ever seen. The girls were free and it was just $2 for an adult. We strolled around to Stow Lake where the girls fed the ducks and swans and spotted squirrels in nearby trees. We enjoyed watching the boats row past. We would have loved to visit The Academy Of Science nearby but ran out of time. We used our trusty red bus ticket to take us to the iconic bridge and then a connecting shuttle took us across. After taking some family snaps we decided to stroll our way back across the bridge, which really was a beautiful way to see the famous landmark and the harbour. Stevie (5) walked alongside us and Pepper slept in the pram. We then got the red bus to take us to Haight Ashbury where we enjoyed checking out the thriving local alternative scene, had some lunch and I bribed the entire family with ice cream while I darted across the street to do a little vintage shopping. We stayed in an Airbnb apartment in the upcoming area, Hayes Valley. We found this to be an inspiring area to stay, with lots of great little bars and restaurants just a short stroll to Hayes Street. Plus, it had a small playground for the kids, a cute cafe called Mercury Cafe with decent coffee and organic food for breakfast, and a cool shipping container beer garden. It was easy to walk or grab public transport to get around town. I'd definitely recommend this area for anyone visiting San Fran – even without babes in tow. Having an apartment also appeals to us when travelling with the kids as you have a kitchen and comfortable lounge area. Plus Airbnbs are always in great locales so you get more of an authentic, ‘local’ experience than you would if you stayed in a hotel in one of the main tourist areas such as Fisherman’s Warf or Union Square.